Are you old enough to remember when the TV remote control was invented? I sure am. Before that fabulous, glorious day, one of my jobs at home was to jump up and twist the channel knob at the whim of my parents, like some sort of orthopedic carpal-tunnel experiment gone astray. But progress sometimes comes in half-steps, and the remote control revolution was gradual. Before we got a real TV remote, we had a non-sensical, half-assed remote, consisting of a keypad connected to the television via a 12-foot cord. Less than seductive technology. After a few days of messing around with it, the iPad reminds me very much of that remote control with a cord. Cool, and a difference-maker, but not 100% transformative. 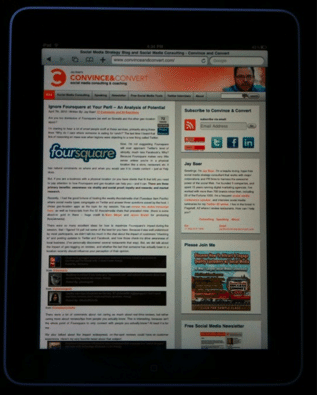 Most of the chatter leading up to the iPad’s release was around how would it perform against standard computing tasks. I have found this to be a poor comparison. I use my iPad instead of my iPhone, not instead of my MacBook. Because as a content consumption device, the iPad is simply without peer. It’s an almost magical device that can show incredibly crisp HD video, all the audio you can handle, Web pages, books, online magazines (Zinio is great on the iPad), newspapers, tweets, Facebook, Linkedin, and just about anything else you’d want to digest. It’s fast, it’s seamless, and it’s enthralling. Using the iPad to do something as mundane as check headlines on your local newspaper’s Web site becomes a visceral, tactile experience as your ability to touch and move content redefines the physiology of the task. Same with email. I’ve never had as much fun deleting spam as I have with the iPad. Swipe. Swipe. Swipe. In truth, the touch mechanics of the iPad are virtually identical to the iPhone. But the size of the iPad makes it feel so much different. You can get your face near the screen, making it seem substantially larger than 9.7 inches. In fact, because of how close you can hold the iPad, to me its screen size feels bigger than my 15-inch MacBook. Little iPhone games like solitaire become substantially more engaging on the iPad. If you read Convince & Convert, this probably doesn’t describe you, but if your computer usage consists primarily of email and the Web, I would seriously consider making the iPad your primary device. I think I sold about seven of them to older ladies on a flight from New York last week. They were instantly in a swoon over the size, light weight, and ability to do what they consider to be “everything” in one package. I am considering with at least moderate seriousness getting rid of my iPhone and getting something that actually functions well as a phone (hello Verizon), and using the iPad for all the rest. The iPad is not a computer. Not even close. The virtual keyboard is barely better than the iPhone, and you still cannot touch type. You can’t save or store files. There’s no USB port. Or CD drive. Or camera. Or ability to run two programs at once. I would never, ever, ever write this blog post on my iPad (although people that bought the external keyboard for it might disagree). As a content creation device, the iPad is pretty much pointless for anything exceeding a two paragraph email. The exception is content that is created by touch. The drawing apps I’ve played with are simply incredible, but that’s not really my line of work – and probably not yours either. Before arrival, I wondered where the iPad would fit in to my robust technology lineup. For now, I think it’s a highly mobile DVD player, game machine, Kindle, iPod, email appliance, and Web surfing device. Which unfortunately makes this MacBook Pro a really, really, really expensive typewriter. I’d love to hear your thoughts if you’ve got an iPad, and I’d be happy to answer any questions you have. Leave them in the comments and we’ll discuss.